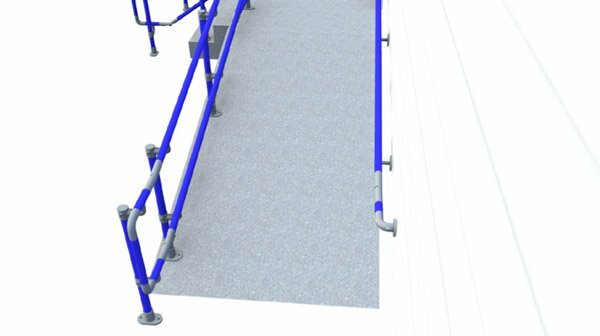 This manual will give you a basic overview of both the DDA guidelines and what is needed to install a Simplified DDA Railing system. 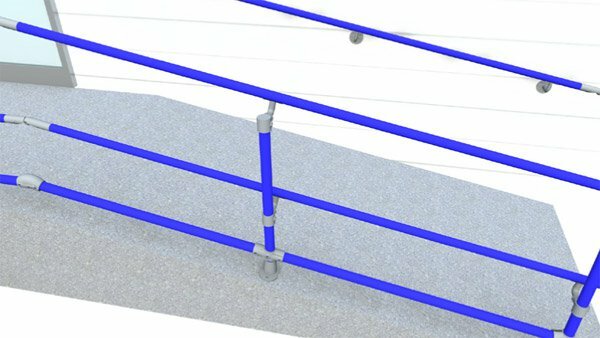 This manual contains basic tips, tools and helpful pictures to show you how to work with the Simplified DDA Railing components. 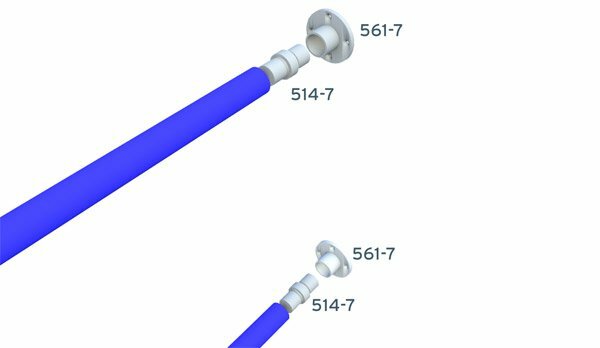 It clearly shows how the fittings and tube go together for most DDA handrail configurations. 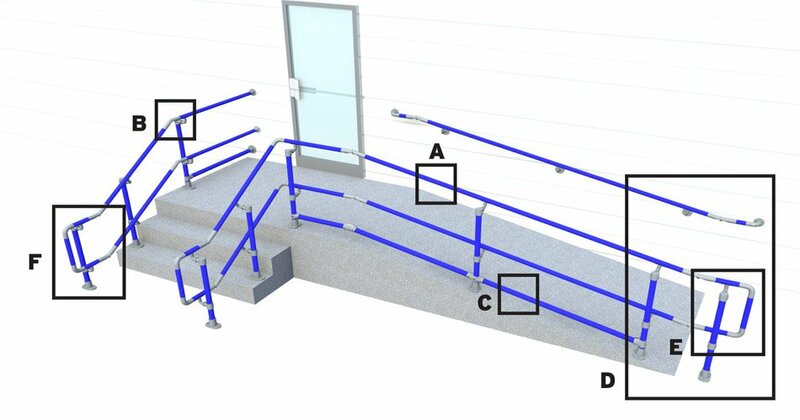 Look at the diagram and close up images to get an idea of what the DDA standard requires for handrail. 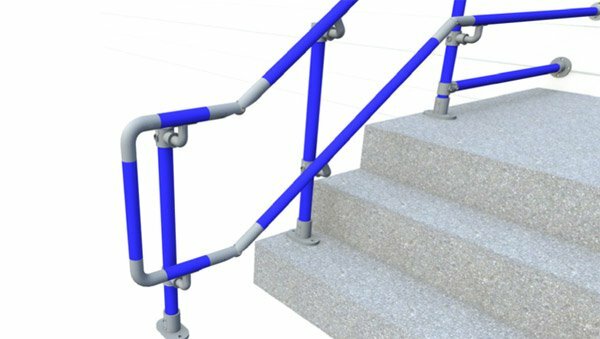 We have pointed out the major considerations when building a DDA compliant handrail. A) Handrail: Handrail must be a continuous smooth surface. A handrail must be on both sides of ramp or stairs. 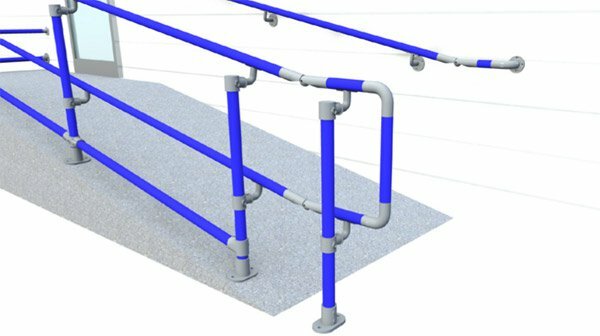 B) Handrail height: Handrail must be 900mm - 1.1m in height. C) Edge protection: When there is a drop off, ramps require a curb or curb rail to prevent wheel chairs from slipping out from under the handrail. In some cases a mid rail is sufficient to provide this protection. D) Clearance: A ramp must have a minimum clear width of 500mm;. E) D Returns: Railing ends need to be rounded or return smoothly into a floor, wall or post. F) Extensions - stairs: The Handrail should extend the width of one stair tread and then level out for 300mm;. 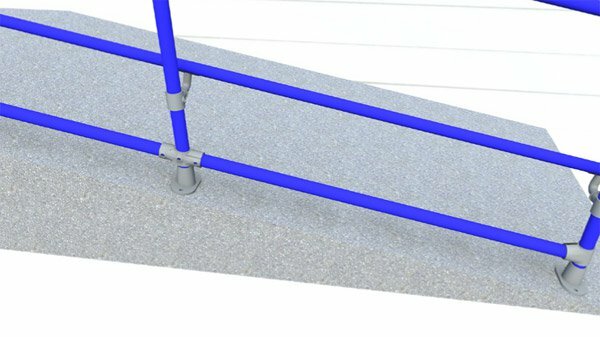 Ramps: The Handrail should extend parallel to walking surface 300mm; past the top and bottom of the ramp. 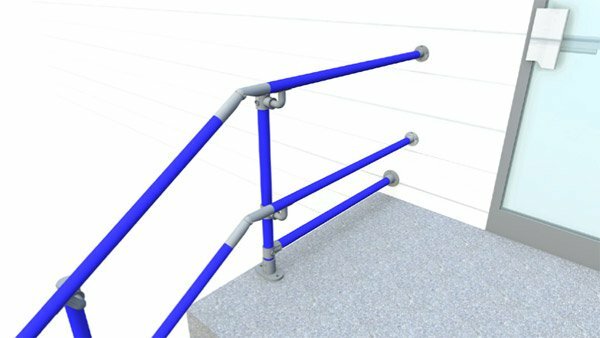 Below is a list of tools, materials and tips for installing Simplified DDA handrails built with Kee Access DDA railing fittings. You do not need many tools to install an Simplified ADA handrail. Saw to cut tube - A chop saw, ban saw or hack saw will be required to cut pipe to length on site. We recommend using a gas powered or electric saw. Drill - A standard drill will be used to drill into pipe and wood. A hammer drill will be required when drilling into brick or concrete. 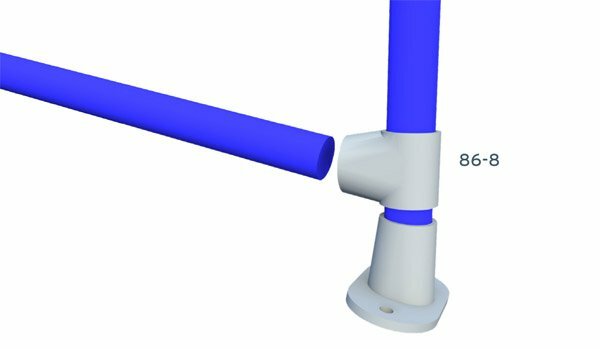 The tube and fittings required to build your handrail will be furnished to you as a part of your Simplified DDA handrail. You will need a few other bolts and screws that will depend upon the surface to which you are mounting the handrail. Self drilling screws (No. 12) or multi-grip pop rivets - You will need these to attach the pipe to the brackets. In general you'll need two screws or rivets for each bracket. 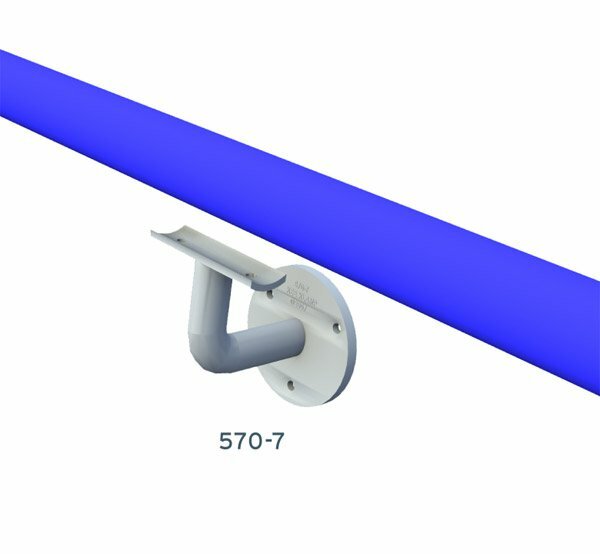 The type of connection you use will depend on what you are mounting your handrail into. 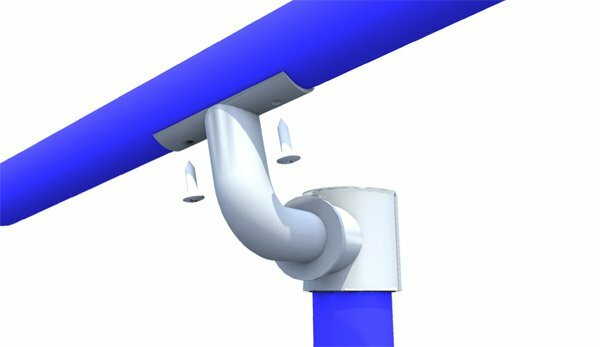 Lag screws, chemical anchors, Tapcons and concrete anchors have been used to mount the base flanges to various surfaces. Cut the tube at the job site. Use base flanges instead of core drilling to prevent rust to upright. Centre uprights no more than 6' from each other. Beware of placing base flanges too close to an edge. Uprights must be offset from corners and bends in the handrail. Consider pre-drilling the holes for the self-drilling screws. This diagram illustrates building a DDA handrail that has a top, middle and bottom rail. A bottom rail is required when there is no curb on a ramp. 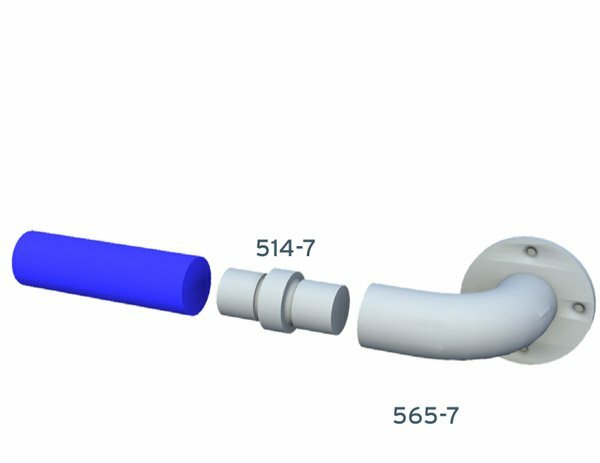 Please investigate the drawing below to learn how the different fittings for each assembly go together. A) Standard Upright: The 62-8 base flange is for mounting to level surfaces. The 518-7 connects to 10-848 and 10-840C fitting. B) Ramp upright: The 67-8 base flange is for mounting to angled surfaces. The angle is fixed by tightening the set screws. The railings are attached in the same manner as the Standard Upright. The bottom rails are connected with 89-8 on mids and 86-8 on ends. C) Wall mount: The 570-7 is connected to the wall or wood posts using 1/4" screws or bolts. The 570-7 is attached to the railing with No. 12 self-drilling screws or pop rivets. D) D Returns: D returns are constructed with 520-7s and 514-7. 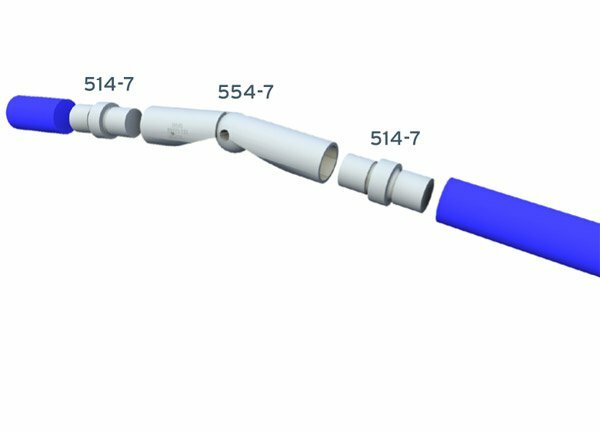 The 520-7s are connected vertically with a small piece of pipe. This assembly is then joined to the top and midrail with 514-7s. 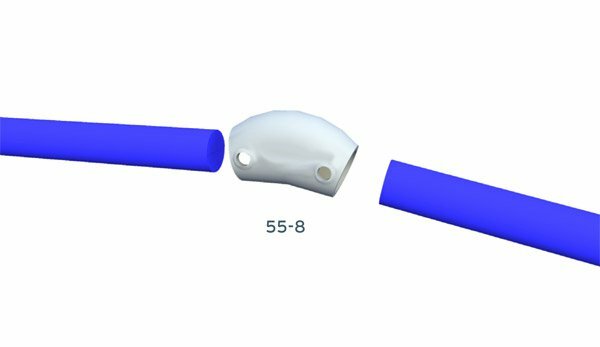 E) Adjustable angles: In order to accomplish angles with a smooth surface, use the 554-7 and 514-7s. These are frequently used at the top and bottom of ramps and stairs. 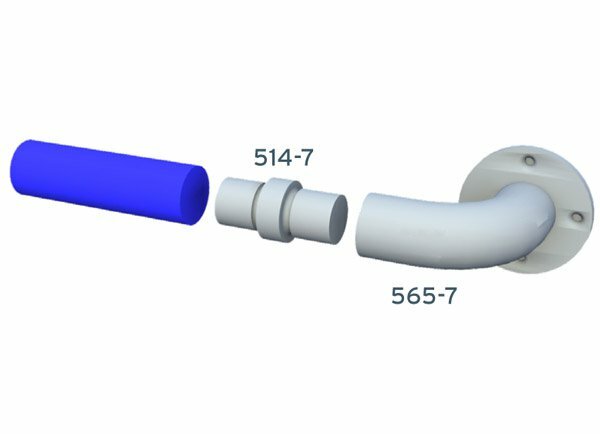 F) Wall returns: The 565-7 wall return flange is connected to the wall and then connected to the pipe with a 514-7. This diagram illustrates building a DDA handrail that has a top and bottom rail. A bottom rail is required when there is no curb on a ramp. 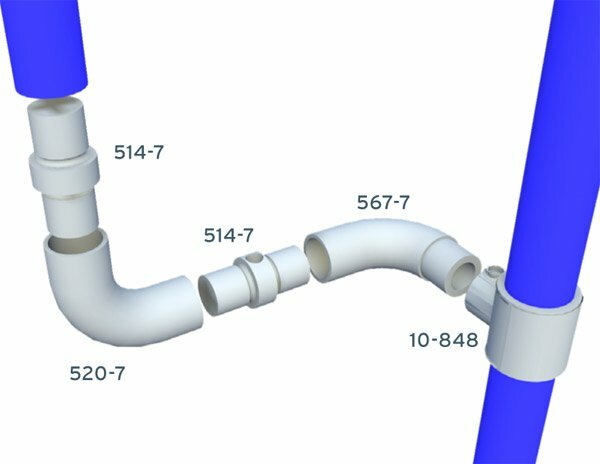 Please investigate the drawing below to learn how the different fittings for each assembly go together. B) Ramp upright: The 67-8 base flange is for angled surfaces. The upright angle is fixed by tightening the set screws. The railings are attached in the same manner as the Standard Upright. The bottom rails are connected with 89-8 on mids and 86-8 on ends. 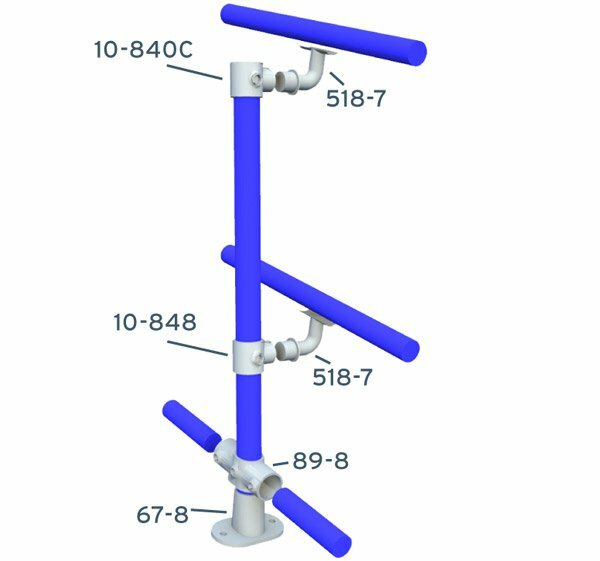 C) Wall mount: The 570-7 is connected to the wall or wood posts using 1/4" screws or bolts. The 570-7 is attached to the railing with No. 12 self-drilling screws. D) D Returns:The D-return connects to the post using the 567-7 and 10-848. The 10-848 receives the small end of the 567-7. The 567-7 is then joined to the 520-7 using a 514-7. E) Adjustable angles: In order to accomplish angles with a smooth surface, use the 554-7 and two 514-7. These are frequently used at the top and bottom of ramps and stairs. 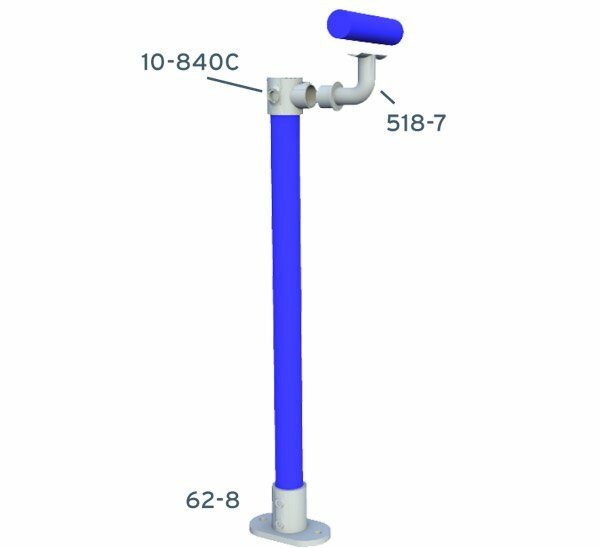 F) Wall returns:The 565-7 wall return flange is connected to the wall or wooden posts with 1/4" screws or bolts. 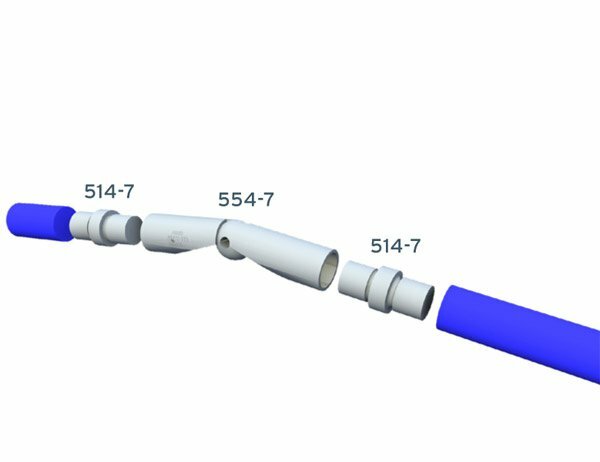 It is then connected to the pipe with a 514-7. 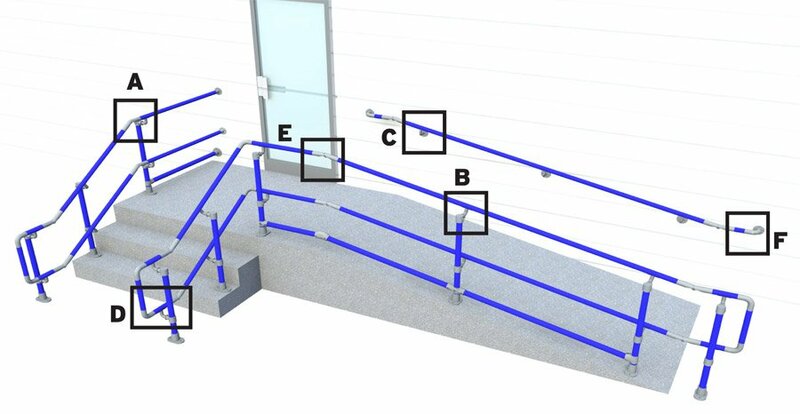 The diagrams below illustrate other scenarios that come up when installing a Simplified DDA handrail. 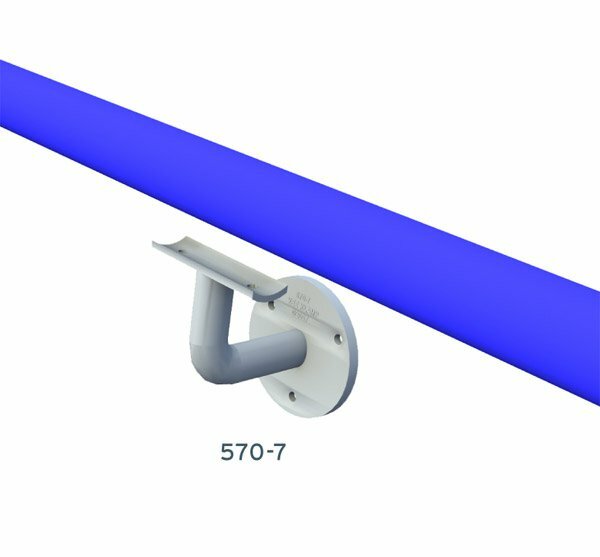 Bottom rail railing end: Connect the bottom rail to the wall with a 61-8 wall flange. Bottom rail vertical change: The vertical change on the bottom rail of a ramp is typically done using a BC53-8 or a 55-8. 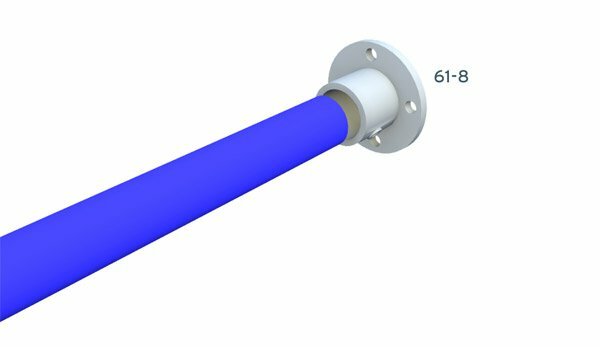 Post mounted ramp bottom rail end: The bottom rail on a ramp terminates into a railing post using a 86-8. When the set screw is tightened, the angle of the bottom rail will be fixed. 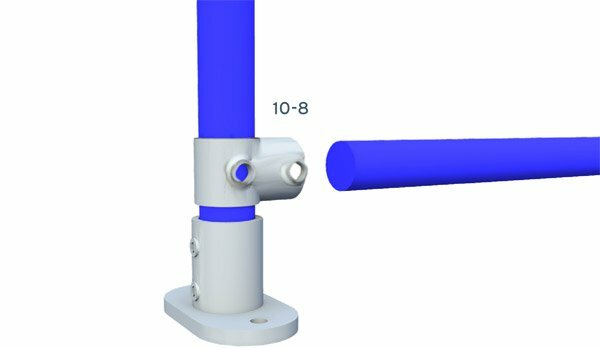 Post mounted bottom rail end: The bottom rail on a flat surface terminates into a railing post using a 10-8. 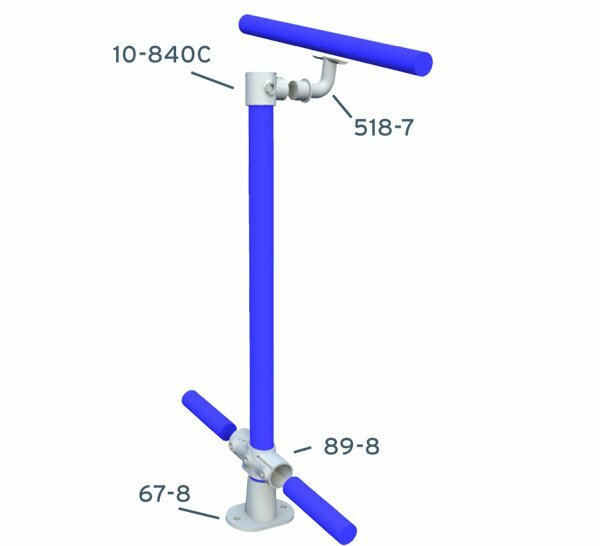 Handrail railing end: Mount the 561-7 to the wall. 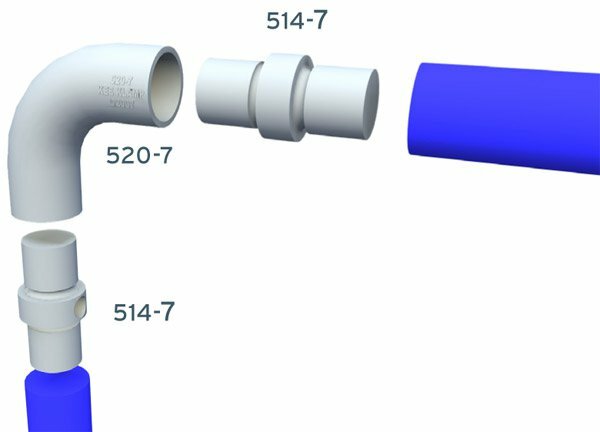 The handrail or mid-rail pipe is then connected to this fitting using a 514-7. 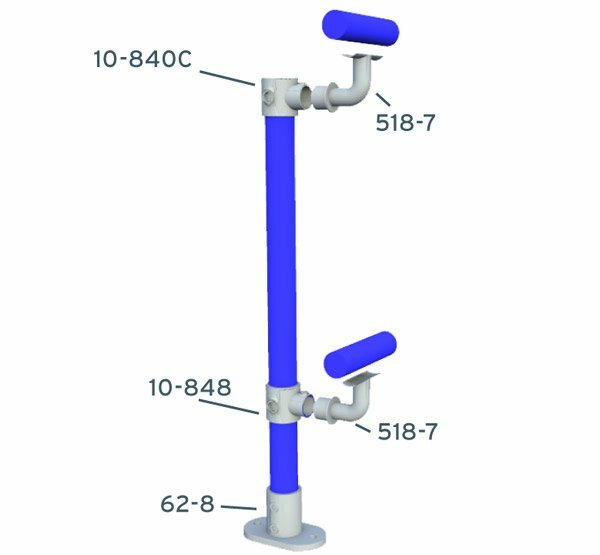 Handrail bracket attachment: Brackets attach to the handrail pipe with two No. 12 self drilling screws or pop rivets. Use high quality hardware for the best results.